"GOD DOESN’T MAKE THINGS WRONG. WE MAKE OURSELVES WRONG. BUT HE MADE YOU RIGHT. HE DIDN’T MAKE YOU WRONG. IF YOU HAMPER YOURSELF WITH FEARS THEN YOU WILL MAKE YOURSELF WEAK. THIS IS THE FIRST DAY IN MY FIRST CHURCH AND FOR ME, THIS IS INDEED A DAY THE LORD HATH MADE. THE LORD HAD HIS EYE ON ME AND HE CALLED TO ME TO BE A MINISTER. GOD SPOKE TO ME AND SAID: 'NORMAN, I HAVE COME SO THAT YOU MAY HAVE LIFE AND HAVE IT MORE ABUNDANTLY' AND I, NORMAN VINCENT PEALE, GIVE IT TO YOU RIGHT NOW." 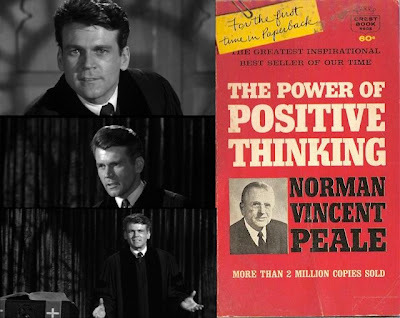 Are there any late Baby Boomers or early Generation X types who do NOT remember seeing well-worn, dog-eared copies of Dr. Norman Vincent Peale's huge best selling book "The Power of Positive Thinking" resting handily on their Dad's desk, book shelf, night table or bathroom reading rack? As a kid, I used to try diving into it, but found the book dull as dishwater. My Dad was, if I do say so myself, a brilliant marketing man who promoted beer in Canada at a time when traditional advertising of alcoholic beverages was illegal and rigorous promotional tie-ins (usually through sports - both amateur and professional) needed to be devised. In his wide territory, he made his company's flagship beer Number One and also tied the company into numerous world hockey championships. When I asked Dad about the book, he referred to it as the Bible for all successful businessmen and added, "It's one of the reasons your old Dad is the best goddamn beer salesman in the country." Years later, I read Peale's book. Dad was right. It was super inspirational and full of numerous tips for success. It rocked. But for some reason, though, I never equated the book with Judeo-Christian beliefs and values. Maybe when you're brought up in that tradition, you just don't notice that sort of thing as much. Or maybe, this was Dr. Peale's secret to success in his own life. One Man's Way was, I must admit, a revelation to me in more ways than one. It's an old-fashioned biopic in the grandest Hollywood tradition, but for some reason, I'd neither seen it before, nor even heard of it. I'm glad, however, to have finally caught up with it. The movie answers more than a few questions I had as a kid about Dr. Peale, but it's also revelatory with respect to its star, Don Murray. As Norman Vincent Peale, Murray is absolutely electrifying. In fact, it made me realize what a great actor he was. (He's currently in his 80s and still working.) But in his 20s and 30s, with that weird mixture of baby face, square-jawed tough man and blessed with the most piercing eyes, one has to wonder why he never became a bigger star. In the early 1950s he was a constant presence on the stage as well as numerous live television dramas during the Golden Age of American TV. In feature films he etched indelible portraits in Bus Stop (opposite Marilyn Monroe), A Hatful of Rain, Advise and Consent, Baby The Rain Must Fall and perhaps most memorably in The Hoodlum Priest. Then, through much of the late 60s and onwards, most of his work was in television - much of it fine, but often relegated to roles of cops, cowboys, politicians and lawyers (of the seediest kind). That said, his role as the villain in the 70s theatrical feature Conquest of the Planet of the Apes (the terrific Arthur P. Jacobs production that was woefully re-tooled as Rise of the Planet of the Apes) was and still is utterly delectable and creepy. In One Man's Way, though, is where you really get a sense of how brilliantly he commanded the attention of a camera lens. He drew it towards him like a moth to a flame and as Dr. Norman Vincent Peale, Don Murray was totally on fire. Directed by Denis Sanders, it has no strong auteurist imprint, but the proceedings are handled with the sort of proficiency needed to move the fine script by John (The Invaders) Bloch and Eleanore (Imitation of Life) Griffin forward and to capture Murray's blistering powerhouse performance as the preacher with a calling to change the lives of men everywhere. The movie begins with Norman as boy engaging in fisticuffs with another lad during a church service and publicly embarrassing his Minister Dad (William Windom). Even worse is when Norman announces in front of his father's congregation that he doesn't believe in God and Dad orders him "out of God's House." Norman runs away, much to the horror of Mom (Virginia Christine), but Dad knows his son all too well. Sure enough, Norman sneaks into God's House and engages in a heart to heart with the Lord and then Dad. He's back in God's bosom, but vows that he'll never be a preacher like Dad. Flash forward many years later and Norman (Don Murray) is working as a news reporter with a comely wise-acre hot-chick photographer (Carol Ohmart). They cover a brutal domestic murder and Norman starts to get a bad taste in his mouth. He admits to his editor he might not be cut out for journalism. His editor and female WeeGee-style partner are aghast since Norman is apparently a great writer. Norman's response is simple: "I feel like I'm watching children playing in tall grass as a snake is about to strike. What do I do? I pull out my notepad." And, as Hollywood would have it, a huge explosion rocks the neighbourhood on the heels of Norman's utterance of self-loathing. A gas explosion round the corner has blown half a building to rubble and the lone survivor is a little girl (Veronica Cartwright) perched at the top, too terrified to cross a plank of wood that's been extended to the next building in order to rescue her. What's the son of a Preacher Man to do? He talks the child to safety with all the evangelical fervour of a man born to minister God's Word. He reminds the little girl that God is always "there with you". He quotes God's words: “I am with you always” Alas, this doesn't quite do the trick and the child screams and bawls when another explosion rocks what little of the teetering building is left. Well, now's the time to make God's word really count and Norman (via Murray's inspired, crazed delivery) passionately, almost mantra-like, orders the child to use God to help herself. It's safe to assume that Norman Vincent Peale has heard the calling of the Lord. He turns in his "sword and shield" (pen and notepad), goes to the seminary, argues with all of his teachers, graduates with flying colours and is sent to minister the University Methodist Church in Rhode Island. Here he immediately wins over his flock with his own passionate interpretation of Psalms 118:24 - an appropriate opener to be sure: "This is the day the Lord hath made. And he made it for you and for me,” he bellows. Earning a doctorate he moves to a physically larger church in Syracuse which has fallen on hard times. He begins to do everything in his power to promote the church. Every person he meets in the streets he cajoles into coming to worship. He even inadvertently asks a Jewish man to join the church. When the fellow of God's Chosen People reveals his religion, Norman insists: "Go visit your Rabbi, then. He’s a great guy. I met him just the other day." He adds with the wink of a used car salesman: "Your Rabbi and I, we both work for the same boss, you know. Shalom!" "Lost Your Gal? In a Lurch? Don’t Panic, Pal. Go To Church!" One of the spluttering Deacons declares: "You cannot build the house of the Lord on the foundation of the Devil." Norman uses Christ to defend his methods and says that the Sermon on the Mount was how the Word was spread back in the olden days, but now, "God has given us other ways to get to men’s hearts." For Norman, these other ways are ad copy. And, of course, Norman finds love. He pursues Ruth (the wonderful late Diana Hyland), a beautiful, young college girl who spurns his advances thinking that a "good time gal" like her would never click with a Man of the Cloth. This is nonsense, however. Especially in Hollywood terms. They not only meet cute (she rear-ends his car), but as Norman himself says, "God’s most potent chemistry is when the attraction is mutual." And it most certainly is. Hyland, by the way is extremely fetching in this role. She too toiled mostly in television during her career which was tragically cut short when she died of cancer. Most audiences will remember her from The Boy in the Plastic Bubble which she starred in with John Travolta. She and Travolta became a passionate item in real life (she was 17 years older than he was) and apparently, he was with her when she died and furthermore, was so traumatized by her passing that he wasn't seriously involved with any woman until he married Kelly Preston many years later. Rumour mongers and tabloids insist both she and Preston are beards to mask his purported gay proclivities. Whatever the truth, she was stunningly gorgeous, had great screen presence and in One Man's Way, she fills the love-interest role with sauciness and passion. The remainder of the film details Norman taking over a huge Church in New York where he continues his hucksterism to boost attendance, becomes a popular radio personality, an advice columnist in Look Magazine and then puts the Lord's Words into his own and writes his bestselling self-help book "The Power of Positive Thinking". The conflict between Norman and the established old guard of organized religion here takes centre stage and it's a fight to the finish. And WHAT a finish! Norman, on the verge of resigning is witness to one of God's miracles! Surely this will convince him to stay in the pulpit "for as long as God needs me." This movie is one rip-snorting entertainment. The accent is on a driven iconoclast and in many ways the picture can work as either an affirmation of God or simply an affirmation of One Man's power. Either way, it's an immensely uplifting picture and Don Murray gives such a great performance, one can only wonder why he wandered (mostly) through the vast wasteland of network television for the next four decades. Perhaps, as Norman Vincent Peale and his ilk would say, it was God's Will. One Man's Way is another recent release from the MGM Archives. It appears that most, if not all of these titles are not actual MGM productions (those are now part of the Warner Brothers library), but are rather all the independent films MGM picked up for distribution. The movie exists as an on-demand DVD-R. It's a no-frills affair with a premium price and a straight-up transfer. Happily, the source material is in excellent shape and the film looks pretty decent on a big monitor. This is especially a blessing since the movie is shot in full-bodied black and white by the legendary Director of Photography Ernest Laszlo (D.O.A., The Big Knife, Judgement at Nuremberg, Kiss Me Deadly, Stalag 17, While The City Sleeps, etc.) Like all on-demand archives titles, only a few retailers stock any titles at all (in Toronto, Canada the Yonge-Dundas Sunrise Records and the newly-resurrected Starstruck Video at Dundas and Tomken stock them) and the only other option is online ordering which not only costs the premium price but shipping and handling. I have a feeling, however, that this title is going to sell very well and ultimately demanded its own proper release.